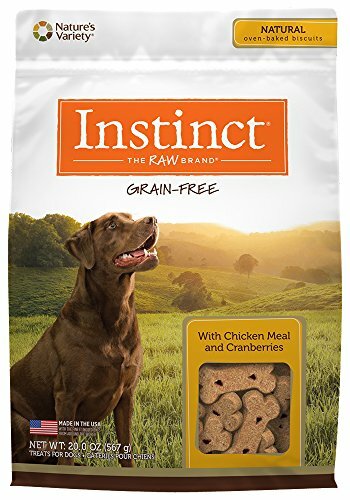 OVEN BAKED GRAIN FREE DOG TREATS WITH CHICKEN: Instinct grain free dog treats are a delicious and healthy dog treat, perfect for training & treating. Our bone shaped biscuits are made with chicken meal, cranberries and other wholesome ingredients. NATURAL DOG TREATS: Instinct dog biscuits are made with carefully chosen wholesome ingredients for a great tasting, healthy treat. Our treats are always nutritious and made without grain, corn, wheat, soy, potato, artificial colors or preservatives. HEALTHY DOG TREATS: Instinct oven baked biscuits contain no added salt or sugar. Fill your dog treat jar with Instinct grain free dog treats - perfect for training or treating small dog to large dogs. A perfect complement to any dry or wet dog food. RAW INSPIRED DOG TREATS: Our dog biscuits are made with real ingredients, making them perfect for your dog's training & treating from puppy to senior. Dog treats made in USA with the finest ingredients from around the world. OUR BEST DOG TREAT: We craft wet & dry dog food & treats from real ingredients. Compare Instinct to Blue Buffalo, Rachel Ray, Hills Science Diet, Zukes, Iams, Taste of the Wild, Merrick, MilkBone, Greenies, Old Mother Hubbard, Dingo, Wellness & Nutro.